Oology (or oölogy) is a branch of ornithology studying bird eggs, nests and breeding behaviour. The word is derived from the Greek "oion", meaning egg. Oology can also refer to the hobby of collecting wild birds' eggs, sometimes called egg collecting, birdnesting or egging, which is now illegal in many jurisdictions. Oology became increasingly popular in Britain and the United States during the 1800s. Observing birds from afar was difficult because high quality binoculars were not readily available. Thus it was often more practical to shoot the birds, or collect their eggs. While the collection of the eggs of wild birds by amateurs was considered a respectable scientific pursuit in the 19th Century and early 20th Century, from the mid 20th Century onwards it was increasingly regarded as being a hobby rather than a scientific discipline. In the 1960s, the naturalist Derek Ratcliffe compared peregrine falcon eggs from historical collections with more recent egg-shell samples, and was able to demonstrate a decline in shell thickness. This was found to cause the link between the use by farmers of pesticides such as DDT and dieldrin, and the decline of British populations of birds of prey. Egg collecting was still popular in the early 20th century, even as its scientific value became less prominent. Egg collectors built large collections and traded with one another. Frequently, collectors would go to extreme lengths to obtain eggs of rare birds. For example, Charles Bendire was willing to have his teeth broken to remove a rare egg that became stuck in his mouth. He had placed the egg in his mouth while climbing down a tree. In 1922, the British Oological Association was founded by Baron Rothschild, a prominent amateur naturalist, and the Reverend Francis Jourdain; the group was renamed the Jourdain Society after Jourdain's death in 1940. Rothschild and Jourdain founded it as a breakaway group after egg collecting by members of the British Ornithologists’ Union, was denounced by Earl Buxton at a meeting of the Royal Society for the Protection of Birds. Legislation, such as the Protection of Birds Act 1954 and Wildlife and Countryside Act 1981 in the United Kingdom, has made it impossible to collect wild birds' eggs legally. In the United Kingdom, it is only legal to possess a wild-bird's egg if it was taken before 1954; selling wild birds' eggs, regardless of their age, is illegal. However, the practice of egg collecting, or 'egging', continues as an 'underground' or illegal activity in the UK and elsewhere. In the 1980s and 1990s, the fines allowed by the law were only a moderate deterrent to some egg collectors. However, the Countryside and Rights of Way Act 2000 allowed for six months' imprisonment for the possession of the eggs of wild birds and, since it came into force, a number of individuals have been imprisoned, both for possessing and for attempting to buy egg collections. The Jourdain Society continued to meet although membership dwindled after 1994, when a dinner of the society was raided by police, assisted by the Royal Society for the Protection of Birds (RSPB). This resulted in six members being convicted and fined. Despite this, some of those who engage in egg collecting show considerable recidivism in their activity. One, Colin Watson, was convicted six times before he fell to his death in 2006, while attempting to climb to a nest high up in a tree. Another individual has been convicted nine times and imprisoned twice and a third has been convicted 51 times, imprisoned four times and barred from entering Scotland during the bird breeding season. The Royal Society for the Protection of Birds has been particularly active in fighting illegal egg collection and maintains an investigative unit that collects intelligence on egg collectors and assists police in mounting prosecutions on them, in addition to investigating other wildlife crimes. At one point, RSPB staff were being trained by soldiers from the Brigade of Gurkhas in camouflage skills and in surveillance, map and radio techniques, to better enable them to guard nests of rare birds. In the United Kingdom, to avoid the possibility of prosecution, owners of old egg collections must retain sufficient proof to show, on the balance of probabilities, that the eggs pre-date 1954. However owners of genuinely old collections are unlikely to face prosecution as experienced investigators and prosecutors are able to distinguish them from recently collected eggs. It is illegal to sell a collection, regardless of the eggs' age, so old collections may only be disposed of by giving the eggs away or by destroying them. Museums are reluctant to accept donations of collections without reliable collection data (i.e. date and place that they were collected) that gives them scientific value. In the United States, the collection and possession of wild bird eggs is also restricted, and in some cases is a criminal act. Depending on the species, the Migratory Bird Treaty Act, the Lacey Act, the Endangered Species Act, or other laws may apply. When collecting eggs, normally the whole clutch of eggs is taken. Because eggs will rot if the contents are left inside, they must be 'blown' to remove the contents. Although collectors will take eggs at all stages of incubation, freshly laid eggs are much easier to 'blow', usually through a small, inconspicuous hole drilled with a specialized drill through the side of the eggshell. Egg blowing is also done with domestic bird's eggs for the hobby of Egg decorating. Thomas Mayo Brewer, (1814–80), an American ornithologist, wrote most of the biographical sketches in the History of North American Birds, by Baird, Brewer, and Ridgway (1874–84). He has been called "the father of American oölogy". He wrote North American Oölogy which was partially published in 1857. 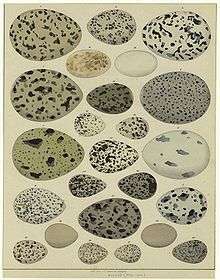 William Chapman Hewitson, Illustrations of Eggs of British Birds, (third edition, London, 1856). Alfred Newton, Dictionary of Birds, (New York, 1893–96). Morris, Francis Orpen (1853). A Natural History of the Nests and Eggs of British Birds. p. 499. Gentry, Thomas (1882). Nests and Eggs of Birds of the United States. Philadelphia. Oliver Davie, Nests and Eggs of North American Birds, (fifth edition, Columbus, 1898). "The Oologist (Journal)". Retrieved 2015-06-21. An 2007 episode of Midsomer Murders "Birds of Prey" surrounds illegal oology. 1 2 3 4 5 Henderson, Carrol L (2007). Oology and Ralph's Talking Eggs. Austin: University of Texas Press. p. 200. ISBN 0-292-71451-3. ↑ Chisholm, Hugh, ed. (1911). "Birdsnesting". Encyclopædia Britannica. 3 (11th ed.). Cambridge University Press. p. 978. 1 2 3 4 Barkham, Patrick (11 December 2006). "The egg snatchers". The Guardian. London. Retrieved October 25, 2012. 1 2 3 Rubinstein, Julian (22 July 2013). "Operation Easter The hunt for illegal egg collectors". The New Yorker. Retrieved 10 November 2013. 1 2 "Egg Collecting". Royal Society for the Protection of Birds. Retrieved 9 November 2011. ↑ George, Rose (3 June 2003). "Egg poachers at large". The Guardian. London: Guardian News and Media Limited. Retrieved 9 November 2011. ↑ Wainright, Martin (27 May 2006). "The day Britain's most notorious egg collector climbed his last tree". The Guardian. London. Retrieved October 25, 2012. ↑ Dolan, Andy (3 January 2008). "Fanatical collector of wild bird's egg jailed for six months". Daily Mail. Retrieved October 26, 2012. ↑ Cohen, Tamara (27 February 2011). "Rare egg thief handed first wildlife ASBO with a ten-year ban from Scotland". Daily Mail. Retrieved October 26, 2012. ↑ Brown, Paul (29 May 2002). "Soldiers train RSPB staff to combat egg thieves". The Guardian. London. Retrieved October 25, 2012. ↑ "Old egg collections". Advice. Royal Society for the Protection of Birds. 12 July 2004. Retrieved November 23, 2012. ↑ "Disposing of old egg collections". Advice. Royal Society for the Protection of Birds. 30 January 2004. Retrieved November 23, 2012. ↑ "Migratory Bird Treaty Act of 1918". www.fws.gov. Retrieved 2016-01-07. ↑ "Lacey Act". www.fws.gov. Retrieved 2016-01-07. ↑ John, Dingell, (1973-09-18). "H.R.37 - 93rd Congress (1973-1974): Endangered Species Conservation Act". www.congress.gov. Retrieved 2016-01-07. ↑ "The Hatching of Oology at the County Museum". San Bernardino County Museum. ↑ William Leon Dawson (March–April 1916). "The New Museum of Comparative Oology". The Condor. Cooper Ornithological Society. 18 (2): 68–74. doi:10.2307/1362747. JSTOR 1362747.